Our solar photovoltaic (PV) systems use crystalline silicon solar panels to convert energy from the sun into electricity which we use to power you lights, tools, computers etc. The electricity is stored in batteries for use during inclement weather and at night. This type of system is referred to as “off-grid” as it is not connected to the utility electricity grid. Our solar pumping systems use the same crystalline silicon solar panels to convert energy from the sun into electricity as our other photovoltaic systems. 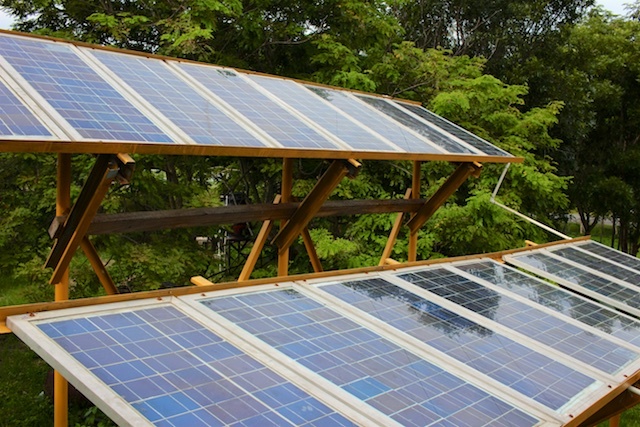 The difference here is that the panels are connected directly to a water pump - the more sunlight, the more water is pumped. The water is stored for later use in an elevated tank, removing the need for batteries, clever right? Our solar water heaters use the heat energy from the sun to directly heat water for use in showers and for washing. We have two types of system; one which houses a copper coil in a glazed and insulated box, and another which is simply a coil of black plastic tubing. The glazed collector is ore efficient, and therefore produces higher temperature water, but also costs more to build. The batteries in our solar photovoltaic systems need de-mineralised water added regularly as a part of their maintenance. To remove our reliance on costly commercial sources, we constructed a distiller that utilises solar evaporation to separate the pure water from the mineral contaminants. The solar cookers are one of our flagship products, and have gone through numerous iterations during our time. They utilise a reflective surface to focus sunlight into an insulated cooking chamber with a double layered glass top. They can reach temperatures of up to 150°C, and are utilised for coffee roasting, baking cookies and even preparing full meals. The food dryers operate on a similar principal to the solar cookers, but operate at a much lower temperature, and therefore have a simpler construction. They consist of a drying chamber, with mesh shelves, but do not require the insulation or reflector, and utilise plastic rather then glass for the top. The traditional wood stoves used by most families in rural Nicaragua are a simple open fire with supports to hold the cooking vessel. The improved stoves create a fully inclosed cooking chamber and a chimney - increasing burn temperature, dramatically improving efficiency, resulting in a lower need for fire wood, and channeling smoke to the exterior rather than filling the kitchen. The ecological ovens utilise a recycled oil drum, clad in bricks and a dirt / water mixture. The enclosed combustion chamber results in higher efficiency, and thus requires less firewood. The use of the drum inside of the brick structure keeps the smoke separate from the food.